Quirky Park, Tons of Shade; Trail Markers Please! If you head northwest-ish, you enter a dense cedar grove with some nice little hills for variety. There were parts of this trail that I really liked, and parts that were really annoying, so I guess that adds up to a 3 out of 5? 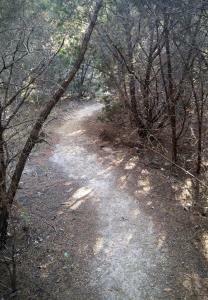 The best part: tons of shade--one of the shadiest trails in Austin--I love that! There's a mixed deciduous woodland and a big cedar brake, and I was in shade more than 85% of the time, I think. 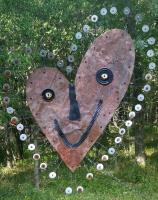 Also, the locals clearly have a quirky, artsy aesthetic, as the trail is decorated with metal yard art at various spots. Not lots of it--just the occasional tucked-away piece to surprise you as you walk along. This is fun. The less good: botanically, it was a bit of a yawn for me--very little was blooming, and what there was is super-common--mostly horseherb and weedy non-native carrot relatives. I did see a good bit of pearl milkvine in bloom, but overall, it was a bit ho-hum for a plant peeper. And the worst part, as almost everyone else has mentioned, is the lack of any properly marked trails. I was worried about getting lost, so although I took a number of random side trails, I ended the hike at 2 miles out of fear of losing my way. I'm usually looking for a 3-5-mile hike after work, so this is not really satisfactory. However, the shade will definitely bring me back, especially in the dog days of summer.